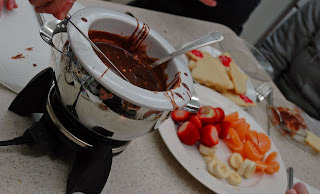 We decided to have chocolate fondue for desert on New Year’s Eve. 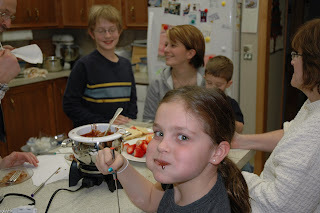 Chocolate fondue is so easy and it is definitely a crowd pleaser. I think I could drink the stuff! Heat the heavy cream in a heavy saucepan until almost boiling (but don’t let it boil). Stir in the Toblerone pieces. Stir until melted. Transfer to a chocolate fondue pot. Serve with pieces of banana, strawberry, small oranges (like mandarins), sugar cookies, marshmallows, etc. Evan makes the funniest faces! 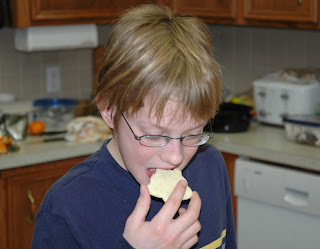 Will likes his sugar cookies without chocolate too! I think we need a washcloth! So….do you fondue? If so, what’s your favorite recipe & things to dip? 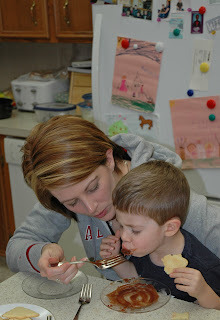 You are here: Home / Recipes / Desserts / Holiday Family Fun – Chocolate Fondue! 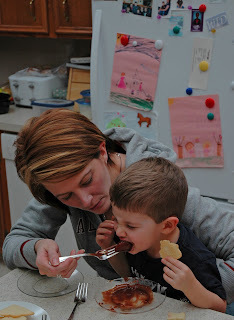 fresh pineapple is the best to dip in chocolate fondue! Mmm I love chocolate fondue!